Glee Club & Jibers (a quartet) were a huge part of my grandfather's life at Wesleyan and as promised you will see below how Glee Club changed his life. In 1926 and again in 1927 the Glee Club won the Intercollegiate championship in the competition held at Carnegie Hall in New York City. In both years our leader was Calvin Kuhl, '27. He was a violinist, had perfect pitch. He led the Jibers also, would listen to a phonograph record, write all four parts on a blackboard and then tell us we were going to sing that piece at the concert that night. In 1928 I succeeded him (not in ability) as leader of the Glee Club. We took fourth place that year. Our coach was Edward H. Laubin, Choirmaster of Hartford's Asylum Hill Church who was made available to us through the generosity of John Spenser Camp, Treasurer of the Austin Organ Company. The Glee Club traveled almost every weekend by bus to give concerts in nearby cities, schools and Alumni affairs. During Christmas vacation we made longer trips, sometimes by private Pullman car. We sang at the old Waldorf-Astoria in New York, the Philadelphia Cricket Club, the Penn Athletic Club, the Hill School, Wellesley College, and many other places. Many of the concerts were followed by a dance with music by our own orchestra, the Serenaders. 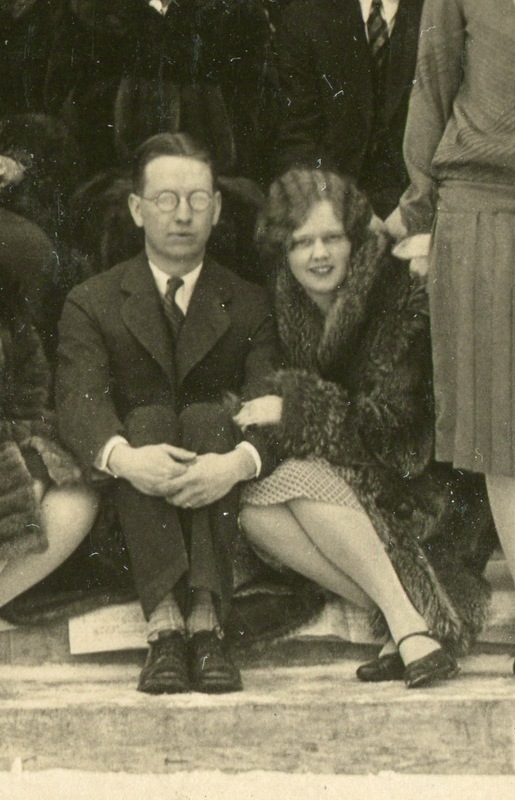 It was at one of these in Manchester, Connecticut High School on March 27, 1926 that I was introduced to a young lady by the name of Dagmar Anderson who, beginning with the Prom dance in 1927 was my guest at all subsequent campus dances and in 1931 became my bride. 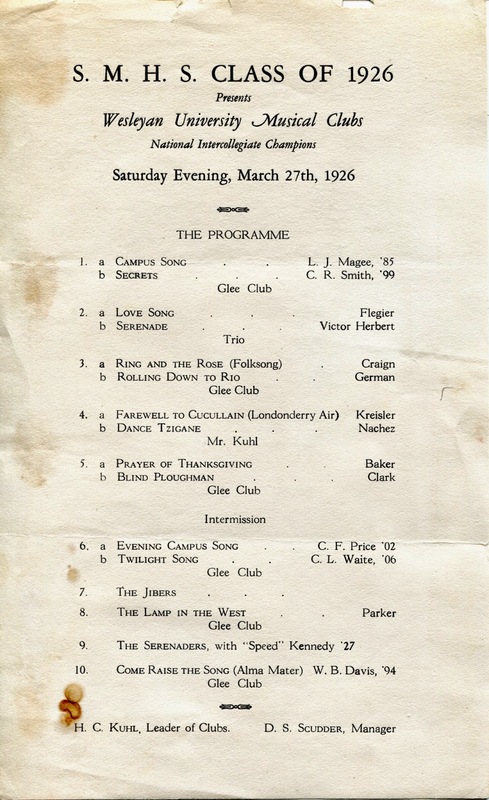 Program from South Manchester High School - the night they met! The Jibers were in demand. In addition to singing at all Glee Club concerts, we sang between the halves at basketball games in Fayerweather Gym, traveled with the President to some of the Alumni Clubs, and occasionally made money by singing at banquets. In 1927 we were hired by Travellers Insurance Co. to sing for several weeks on WTIC radio in Hartford. Cal Kuhl did all of the musical arrangements for this. We were paid $20 each plus travel and dinner. I had been a member of the Olla Podrida (Wesleyan Yearbook) Board in my junior year and in the Spring was elected Editor of the 1928 edition. Later, when I was elected to be leader of the Glee Club for 1928 I had to decide between the two as College Body rules did not permit one person to hold two major posts, so I gave up the Editor post and dropped back to Associate Editor. The College-wide winter prom and the individual Autumn and Spring fraternity dances were elegant affairs. Prom weekend began on Friday night with a dance and midnight breakfast in Fayerweather Gym. This was a formal affair with printed programs in which each dance with your guest would have been signed up weeks in advance. On the following day, Saturday, each of the 12 fraternities held a dance in its own house (formal dress but cut-in dances) and a tea dance on Sunday afternoon. Thus, as Dagmar says, in those days you had better come equipped with something better than jeans; the girls needed two long gowns for the formal parties, another outfit for the tea dance, plus daytime wear for the athletic games viewed in daytime hours. 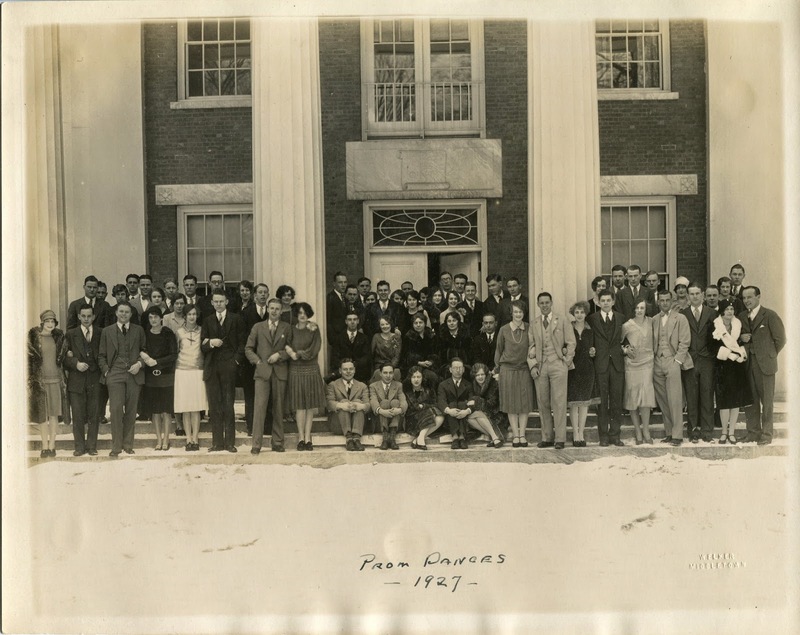 For the Prom weekend the men vacated their fraternity houses and turned them over to their female guests and chaperones. No men permitted above the first floor. The men moved in with the lower classmen in the college dormitories. For the Autumn and Spring dances the female guests were put up overnight in faculty and neighbor's homes. Meals were served in the fraternity houses and there was much singing. It is sad to me that having lived a very productive, interesting and accomplished life, my grandfather was still bothered by Glee Clubs 4th place finish in 1928 almost 60 years later. Letters from their coach, sponsor and the Alumni Association speak to their excellent performance that night and the opinion of many that they should have placed in 1st or 2nd. He kept them, but they don't seem to have helped in healing that wound. Wesleyan did release about a dozen Glee Club performances on cassette tape some years ago and I was also able to find them online. They did include two performances from my father's time in the Wesleyan Glee Club, but not from my grandfather's. I wonder if the Wes library would have them?